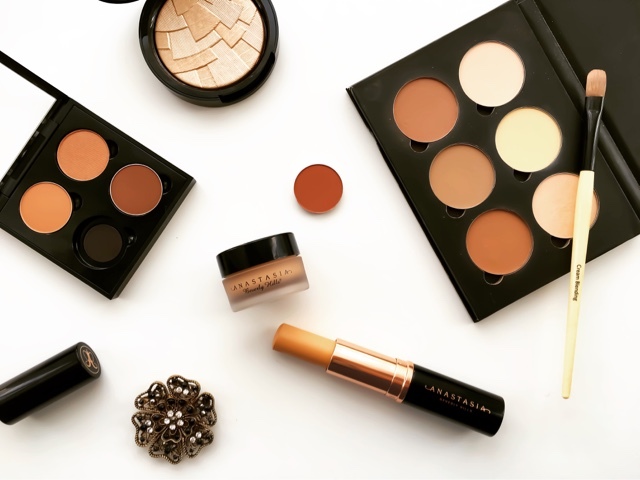 It wasn't until the end of December that Anastasia Beverly Hills launched a site here in the UK with a warehouse in Europe making it easier to get our hands on the goodies we've been lusting over for so long. Ironically the two products I'm reviewing here were actually purchased from Sephora and the US based ABH site before they became readily available to us here. Either way, I am so glad that their whole line is within our grasp now without the prospect of dreaded Customs charges! 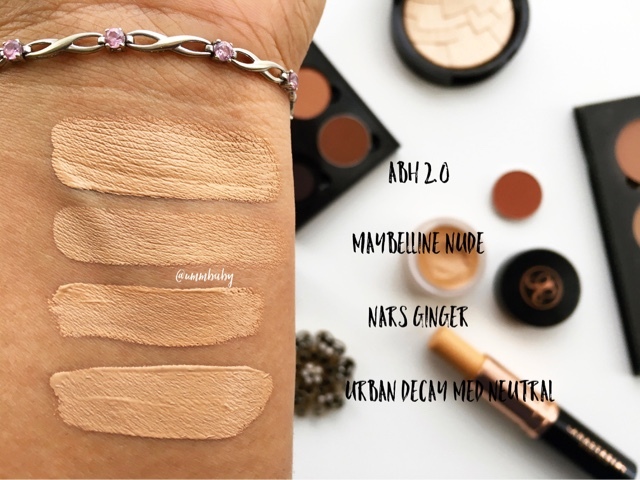 There's been a bit of a resurgence in the popularity of stick foundations lately and while I always avoided purchasing the iconic Bobbi Brown Skin Foundation Stick for fear of it being too drying on my skin, I gave in to the hype of this one. 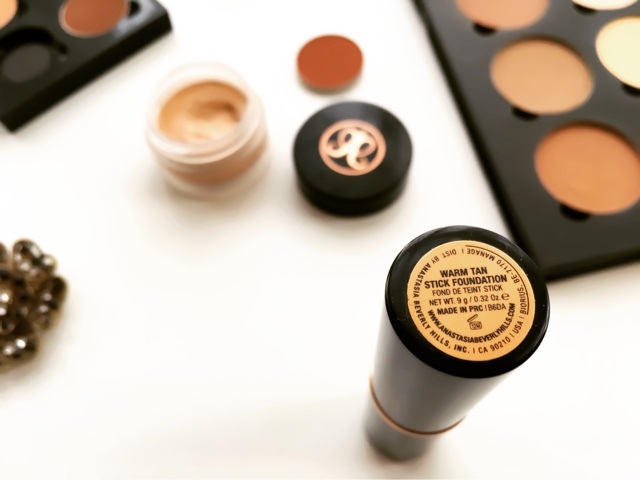 Described as "Highly pigmented, buildable cream formula that leaves a natural matte finish" this foundation comes housed in a beautiful, weighty twist-up tube with gold accents and contains 9g of product. Compared to the Bobbi Brown version, you are getting the same amount of product for £8.78 cheaper. That seems like a bargain to me and was one of the main reasons why I wanted to try this out. The colour match is pretty decent, a touch lighter than I had hoped but not ashy on my skin at all. Obviously choosing the right shade was the usual game of guesswork by comparing and contrasting different swatches and different sources. However this is not because there's a lack of shades. In fact the brand has gone and done what we dream of and released this foundation in a wonderful spectrum of skin shades taking into consideration a number of undertones and ranges. In terms of performance, I have to admit I'm still a little on the fence about it. I don't find it as highly pigmented as ABH likes to claim. Its a medium coverage foundation, that is buildable but because I find it quite a dry texture overall, I am reluctant to add further layers on to build it up. I have oily skin and I've tried this without a primer which just made this slide around to no avail. I've used it with mattifying primers and it was far too drying and clung to dry patches worse than I've had any liquid foundation ever do. I used 3 different styles of brushes and every time it made the foundation cling to my pores, not blend over my skin seamlessly and just looked unflattering. For me, the best method is to apply a hydrating primer such as This Works In Transit Camera Close-Up or Illamasqua Hydra Veil and then push the foundation onto my skin with a damp Beauty Blender. This way makes sure I get the most coverage with one layer of product and leaves me with a natural finish that isn't completely matte but rather more skin-like. It doesn't last quite so long on the skin as you might hope. I can get about 4 hours of wear out of this before it starts breaking down, disappearing completely on my chin and t-zone, and just looking terrible. Its such a shame because while it is fresh, the finish is great and I just wish it had the longevity you seek for a foundation at least for the duration of a working day. It's a little confusing to me that it can't hold up to my oily areas but at the same time is drying out my skin where I'm severely dehydrated. To round up, I'm not really sure where I stand with this. I enjoy using it, I really like the packaging, I love applying weird patterns on my face when I apply it, I love the finish of it...yet at the same time it doesn't really do much for me and I'm quite disappointed with it. Having said that, I can see myself taking with me when I go away anywhere because the packaging is convenient and sturdy for travel. 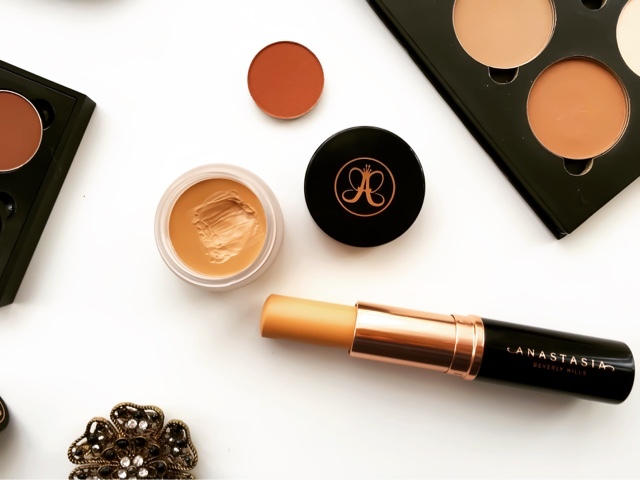 Probably the least talked about ABH product, this concealer comes in a beautiful frosted glass jar and claims to be, "A hydrating full-coverage cream formula that glides over skin without caking...effortlessly camouflague dark under-eye circles, hyperpigmentation and blemishes". I have to begin with a giant SCOFF because that description couldn't be further from how I find the product to perform. 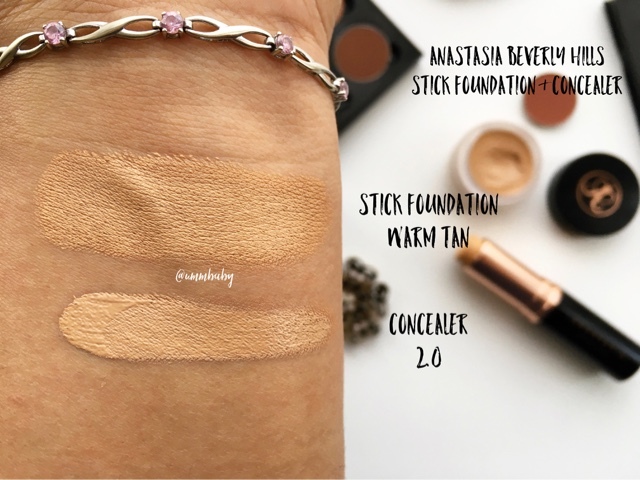 It is indeed a very full-coverage concealer, which is fine and is something I generally prefer, but this concealer makes it way too obvious. I look like I'm wearing full coverage cover-up from probably 10 miles away. To some extent, obvious concealer could be made okay if it wasn't for the ridiculous amount of creasing I experience every time I use this. The colour match isn't quite as bad as I feared. I've swatched it against some of my other popular highlighting concealers and it's pretty similar. The only difference is that this is so pigmented that the highlighting concealer effect is exaggerated a little too much for my liking. But looking at the shades, 3.5 which is meant to be for tan skin with yellow undertones looks too dark. The consistency is very thick and almost gel-like without being hydrating. I use a little synthetic brush to pick the product up from the jar and when I apply it to my under-eye area it doesn't glide, it drags. Thankfully it does blend out really easily and nicely. I use a damp sponge and the super pigmented cream brightens the entire area and once its set in place (be quick about it!) it looks fabulous for an entire hour. That's it! Literally, sometimes by the time I've finished the rest of my face, the concealer starts looking cracked and creased, settling into fine lines I didn't even know I had. AARGH! It's far too drying and doesn't have the lasting power to hold itself up nicely. I think the perfect usage for a product like this is by a makeup artist working on a photo shoot for a very short time. If you are having pictures done and you want your under-eyes to look bullet-proof then you will love this. It's not something for everyday use and definitely not something I will reach for on a special occasion. I'm contemplating selling my one because I feel like I'm going to force myself to use it so it's not a waste and I don't want to force myself to use something that looks horrid on me after an hour!!! If you ask me, I don't think ABH have quite got the hang of base products just yet. They have stolen the hearts of many with their brow products, eyeshadows, contour kits (which I'm currently obsessed with) and lipsticks. I mean, its because of them that I finally purchased a new highlighter after an entire year of claiming that Mary-Lou & Opal were sufficient for me. But they're not quite about the base just yet.